A new species of dinosaur with spectacular headgear has been named after the Alberta woman who found it - who may be one of the best dinosaur hunters in the world. Meet Wendiceratops, a new species of dinosaur with spectacular headgear — named after an Alberta woman who may be one of the best dinosaur hunters in the world. 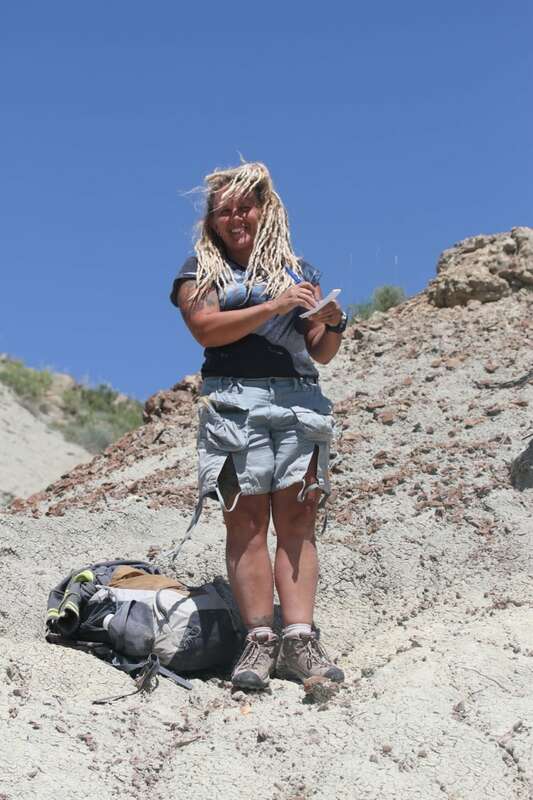 Wendy Sloboda, a professional photographer who lives in Warner, Alta., south of Lethbridge, discovered the first fossils of the new species in southern Alberta in 2010. The hippo-sized horned dinosaur, related to Triceratops, turned out to be a special one. 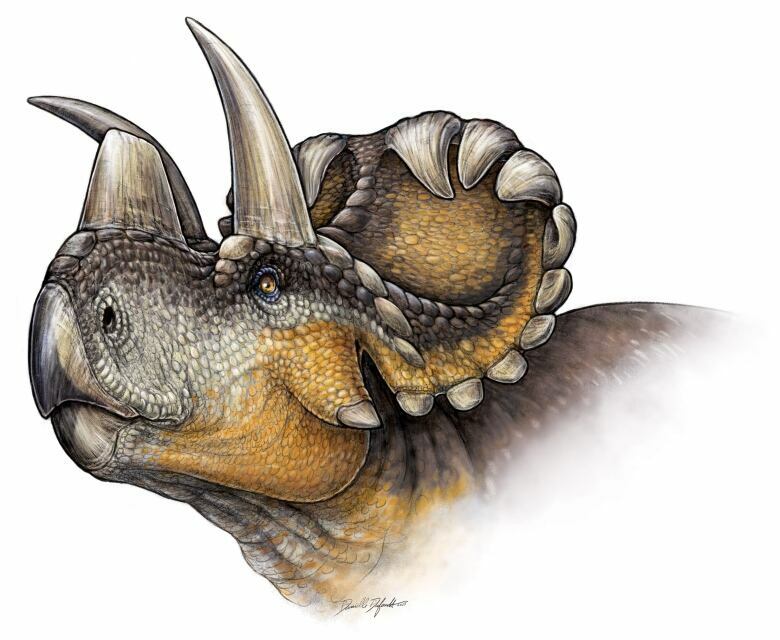 Not only did it have "a pretty spectacular array" of hooks and horns on its head, but it's one of the oldest known members of the horned dinosaur family, said David Evans, a Royal Ontario Museum paleontologist who studied and described the new species. Because of that, Wendiceratops, which lived 75 to 79 million years ago, provides a lot of new information about how horned dinosaurs evolved. The dinosaur got its official name — Wendiceratops pinhornensis — today with the publication of a scientific description in the journal PLOS ONE by Evans, Temerty Chair and curator of vertebrate paleontology at the ROM, and Michael Ryan, curator of vertebrate paleontology at the Cleveland Museum of Natural History. While Sloboda is credited with helping discover thousands of fossils, including many new species, over the past 30 years, this is the first one that's been named after her. "I couldn't think of someone who deserves it more," said Evans. "She's basically a legend in Alberta. She's probably one of the best dinosaur hunters in the world." Sloboda called the name a "big honour." 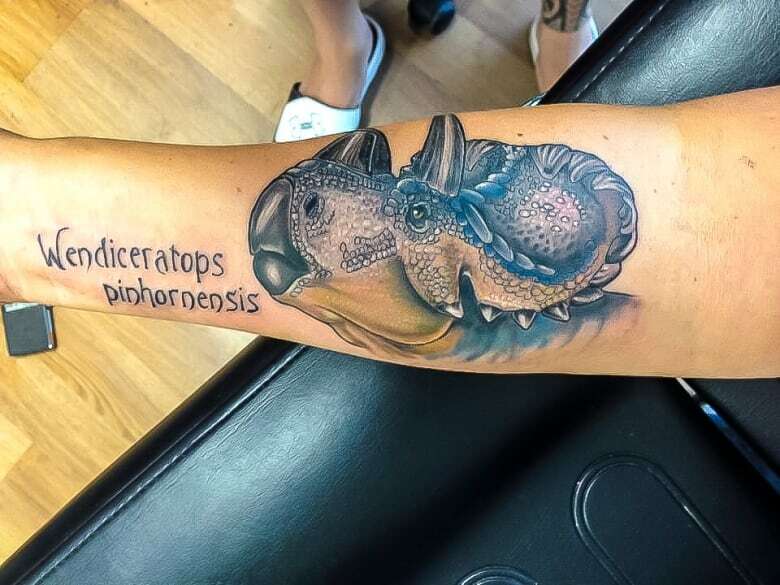 She was so thrilled when she learned about the surprise that she had the dinosaur tattooed on her arm last Thursday. Sloboda got her start fossil hunting with her family as a child, she told CBC News. When she was still a teenager, in 1987, she made a huge find in Devil's Coullee in Southern Alberta — the first dinosaur nesting site in Canada, complete with eggs that had dinosaur embryos inside. She worked for several years at the Royal Tyrell Museum in Drumheller. But even after leaving full-time work in paleontology, she continued to go fossil hunting all over the world with some of Canada's best known paleontologists several times a year. Once a year, she takes part in the Southern Alberta Dinosaur Project with Ryan and Evans, whom she has known since he was an undergraduate student. The paleontologists dig at sites discovered the previous year — often by Sloboda, Evans says. "We often joke that we're Wendy's cleanup crew because Wendy runs around the badlands and finds all this cool stuff and we basically come in afterwards and do the digging," he added. "She just has a sixth sense for finding good specimens." Sloboda drives out to other areas and hikes with a small group, usually students, to go "prospecting" — looking for rocks sticking out of the dirt that she recognizes as fossils from their unusual colour, texture or shininess. "It's really hard to explain," she said. In a remote area near the Milk River in Pinhorn Provincial Grazing Reserve, she spotted a rock that she recognized as part of a horned dinosaur skull. "The bone texture is very distinct," she said. It took her and her crew about two hours to dig out the fragment, which was about 30 centimetres across. She took the GPS co-ordinates of the location, then brought the fossil back to Evans and Ryan at the main dig site. They were quite excited when they saw it, as they could see it was a very old horned dinosaur. "It had some very tantalizing ornamentation — showed curling of some of the horns off the side of the frill," Evans recalled. Further digging the next year confirmed it was a new species: "We had never seen ornamentation like this before," Evans said. Over the next three years, the team "basically moved half a hillside" containing hundreds of tonnes of rock. At the bottom, they found the bones of a whole herd of Wendiceratops, and collected more than 200 bones from three adults and a juvenile. Evans said when the dinosaurs lived, the area was a lush coastal plain along an interior seaway similar to modern-day Louisiana. The Wendiceratops would have roamed alongside tyrannosaurs, duck-billed hadrosaurs, armoured dinosaurs, turtles and crocodiles. They likely died and were buried by monsoonal floods, Evans said. Besides the unusual hooks on the frill at the back of its skull, Wendiceratops had another notable feature — a big horn on its nose. Because other early related horned dinosaurs don't have nose horns, the discovery means nose horns evolved twice in two different horned dinosaur lineages, the researchers said. Their neck frill and horns were probably used to communicate with and intimidate other dinosaurs. They may also have used the horns in pushing matches, the way modern day antelopes and sheep use the horns on the tops of their heads. A 3D-printed model of a Wendiceratops skeleton based on the adult bones was unveiled at Toronto's Royal Ontario Museum in January, for launch of the History Channel TV series Dino Hunt Canada, which featured footage from the dig. It's unusual for fossils to go on display before they're described by science — but fortunate, Evans said. "I think that's amazing. This is one of the rare opportunities where you'll hear about the discovery in the news, and you can go right down to the museum and see it."